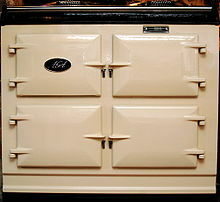 A modern-day three-oven AGA cooker. What appears to be a fourth oven door is the door to the burner. The AGA cooker is a heat storage stove and cooker, which works on the principle that a heavy frame made of cast iron can absorb heat from a relatively low-intensity but continuously burning source, and the accumulated heat can then be used for cooking. Invented and initially produced in Sweden, but since 1957 all production is located in UK. Originally developed to burn coke or anthracite, the Aga cooker was invented in 1922 by the Nobel Prize–winning Swedish physicist Gustaf Dalén (1869–1937), who was employed as the chief engineer of the Swedish AGA company (Swedish Aktiebolaget Svenska Gasaccumulator, English Swedish Gas Accumulator, Limited). Dalén lost his sight in an explosion while developing his earlier invention, a porous substrate for storing gases, Agamassan. Forced to stay at home, Dalén discovered that his wife was exhausted by cooking. Although blind, he set out to develop a new stove that was capable of a range of culinary techniques and easy to use. Adopting the principle of heat storage, he combined a heat source, two large hotplates and two ovens into one unit: the AGA Cooker. The cooker was introduced to England in 1929, and was manufactured there under licence in the early 1930s. Its popularity in certain parts of English society (owners of medium to large country houses) led to the coining of the term "AGA Saga" in the 1990s, referring to a genre of fiction set amongst stereotypical upper-middle-class society. The cast-iron parts were cast at the Coalbrookdale foundry in the 1940s, where they were still made by the Aga Rangemaster Group until November 2017 when Middleyby closed the site with the loss of 35 jobs. A small, traditional two-oven AGA running on gas will use approximately 2,530 watts; 22,200 kilowatt-hours per year (perhaps half that if switched off during the summer months). The average standard gas oven and hob uses 580 kilowatt-hours per year (66 watts), only 2.6% of the AGA's consumption. AGA's own figures for expected energy consumption for their two-oven AGA support this criticism, suggesting average consumption of 40 litres of kerosene or diesel fuel per week, 60 litres of propane gas per week, 425 kW⋅h of natural gas per week, or 220 kW⋅h/week for the electric models. This would indicate that the smallest traditional two-oven gas AGA providing simple cooking functions (i.e. no water heating or central heating) consumes thirty-eight times as much as a standard gas oven and hob, almost as much gas in a week as a standard gas oven and hob in nine months. AGA has provided an analysis of their own, which includes the steps taken to reduce energy consumption. Owners often talk about how the AGA actually makes their homes more energy efficient, as the AGA does a number of jobs, such as replacing several radiators, a tumble dryer, electric kettle and toaster and is not simply a cooker. The vast majority of AGAs sold today are programmable and AGA announced an upgrade initiative in 2009, meaning that owners of older AGA cookers can have them modified so they are programmable. The latest model, the AGA Total Control, uses the same radiant heat to cook, but is designed to be switched off like a regular cooker when not in use, using far less energy as a result. Oil burning AGAs can be fitted with a modern pressure jet oil burner in place of the standard wick burner which burns the fuel more efficiently and so reduces oil consumption. AGA cookers are available in 2,3,4 and 5 oven models with the 4 and 5 oven versions wider than the others. AGA cookers have a boiling and simmering plate, or in models with one hotplate this can be set to either boiling or simmering mode. The AGA is known for its longevity, with many cookers still operating after more than 50 years. In 2009, in conjunction with the Daily Telegraph and to celebrate the 80th anniversary of its founding, AGA set up a competition to find the oldest AGA still in use. There were thousands of entries, but the winning cooker was installed in 1932 and belonged to the Hett family of Sussex. ^ "Coalbrookdale Aga foundry to close by end of November". BBC. 21 November 2017. Retrieved 23 November 2017. ^ "Carbon Footprint – Household Energy Consumption". ^ "2-Oven Aga Cooker Specification". Archived from the original on 8 May 2011. ^ "AGAnomics – The guide to AGA home economics" (PDF). ^ MarmiteLover, Ms (19 March 2010). "In defence of the AGA". The Guardian. London. Archived from the original on 23 March 2010. Retrieved 23 April 2010. ^ "AGA launches upgrade programme for older cookers". ^ "New Generation AGA Models". ^ Edwards, Adam (1 November 2008). "AGA cooker: Hot on the trail of our oldest AGA". The Daily Telegraph. London. Retrieved 23 April 2010. ^ Edwards, Adam (7 April 2009). "The hunt for Britain's oldest Aga". The Daily Telegraph. London. Retrieved 23 April 2010.